Smartphones have become a popular trend over a short span of time. And its not really because they are smart; its because they can be tuned to suit our needs. We are talking about apps. No matter what major platform we consider – iOS, Android, Blackbery – there’s always a typical app catalogue dedicated for phones running that specific platform or OS. People love to browse for apps. The bigger the app catalogue is, the more popular it becomes. iOS, Windows Phone and Blackberry all have dedicated hardware running them, but iOS is undoubtedly the most popular. On the other hand, let’s take Android. Nexus devices apart, Android devices don’t have dedicated hardware. Performance and compatibility issues are most common in them. Yet, its quite a well known fact that Android is more popular than Blackberry and Windows; and that’s largely because Android’s app catalogue is way larger than both of Windows and Blackberry. If you’re using feature phones, there is little you can really do with them other than making calls or sending messages. But, if your phone happens to support GPRS or 3G, you can also enjoy similar App Store (Smartphone) like experience with biNu. biNu is an application for both smartphones and feature phones which lets you to access large number of cloud based apps which you can add to the biNu home screen. Each of these apps run on a WAP based protocol which makes it easier to render them on all feature phones as well as on smartphones. Games, entertainment, books, and utilities – the biNu app catalogue has a hundreds of cloud apps and services of different categories. The apps, being completely on the cloud does not take up any space on your phone; so you don’t have to worry about limited internal memory. biNu is also well optimized to run on slow data connections. So you get faster load times with almost no waiting at all. The biNu app menu resembles the Android App Drawer. 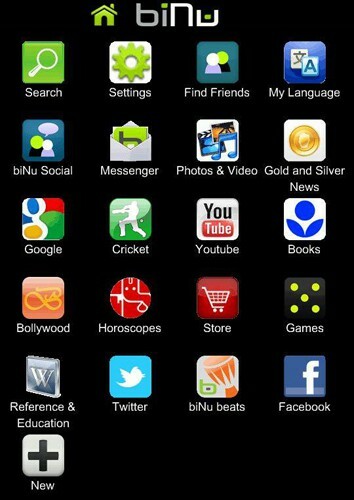 biNu also hosts popular apps (WAP versions) like Facebook, Twitter and Messenger, so you always stay connected. Signing up for a free biNu account opens up many other extra features, allowing you to back up your biNu apps or use services like Photo & Video or biNu Messenger. The speed, simplicity and lightweight nature of the apps has a great potential to become favorite among feature phone users. But biNu is available for smartphone platforms like Android and Blackberry. It is not, however, available for iOS. biNu is also available as a JAR installable for all Java supported feature phones.